No photo of last night’s dinner because it just was not a pretty plate of food. I made some simple boiled potatoes – I’m eating more of the all-blues from Alex Weiser and his siblings, but they’re not pretty. When you cut them open they look a great deal like a russet that’s been stored in a damp place. They make sort of muddy looking mashed potatoes, but they’re DELICIOUS. They do work great for home fries or roasted potatoes. Alongside them I made some braised radicchio with just a little bit of panchetta. It was fabulous, but it was decidedly NOT pretty. I guess this would classify as peasant food somewhere in time and space; it was a pretty yummy near-vegan meal. (For myself, I’m loose about “vegan”; panchetta is a seasoning, not a meat) So, sorry, kids no photo. 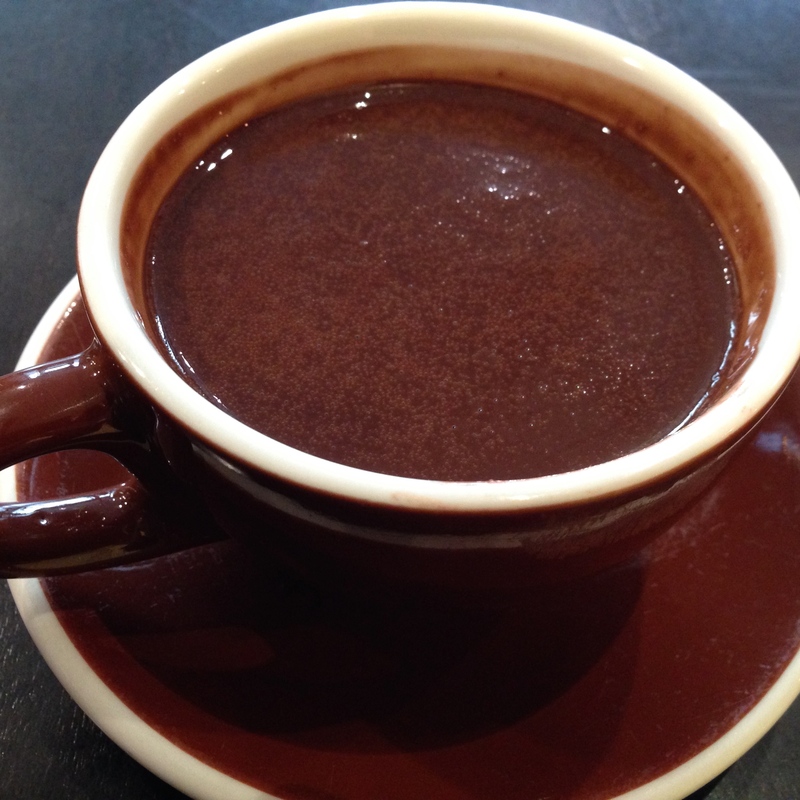 As a consolation, here is a photo of beautiful lush Venezuelan hot cocoa from a shop here in Pasadena that I found last week. I actually wish it had been an espresso cup-ful. this was a full coffee cup and I was on serious overload when I walked out of there. Now, I’m into the kitchen to make a batch of Aztec Brownies with some chocolate that I brought home from Oaxaca. Want some?